The Sei Whale (pronounced “Say”) is an irregular visitor to our area. I say “irregular” because we may go years without seeing one, then dozens may move into the Stellwagen Bank area seemingly overnight. As you might guess, prey distribution probably has a lot to do with these unpredictable shifts in Sei Whale abundance. Sei whale’s feed primarily upon copepods and krill, so large influxes of either of these zooplankton species will often bring Sei Whales into the area. 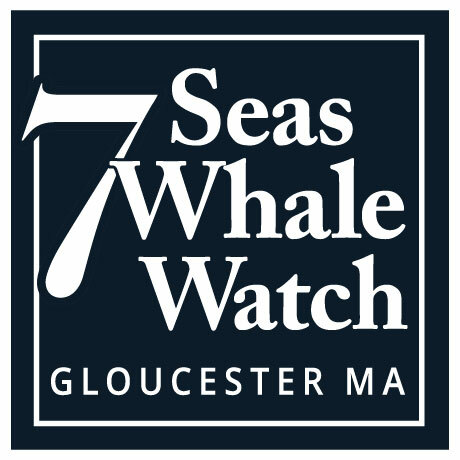 The Northern Right Whale, one of the most endangered whales in the world, is another species that feeds largely on Copepods and so whenever Sei Whales are seen in the area it’s a good bet that Right Whales may be nearby as well (or vise verse: Where there are Right Whales it’s a good idea to keep an eye out for Seis). Identification of a Sei Whale is difficult for whale watchers not familiar with this species. 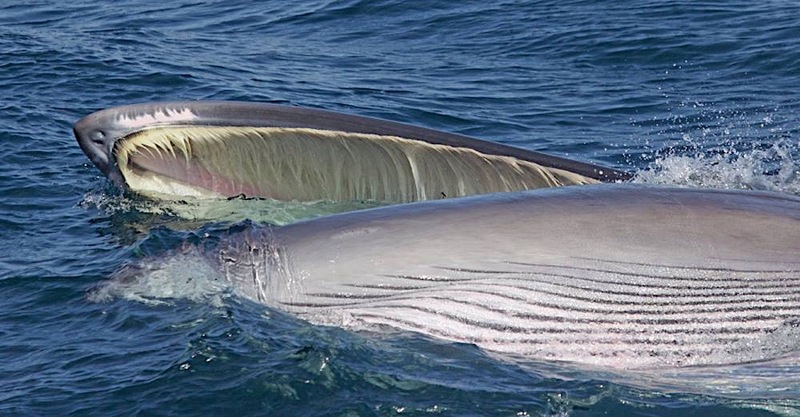 Sei Whales look superficially very similar to Finback whales only they are smaller, darker, and lack the asymmetrical coloration of the Fin Whale. 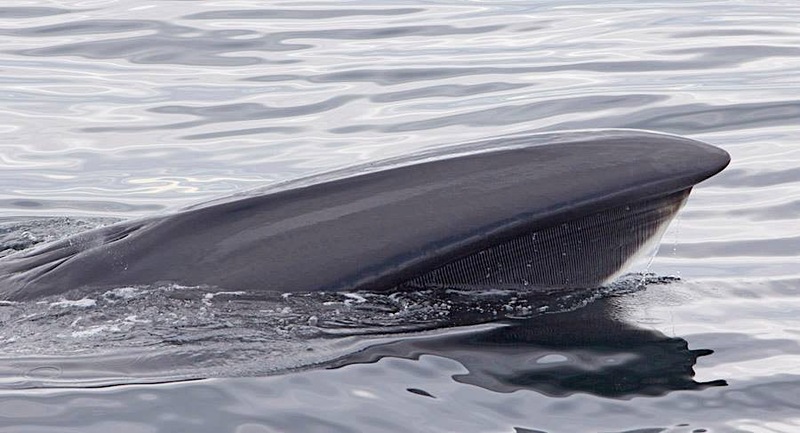 Upon close examination, Sei Whales are often marked with lighter “spots” which are actually scars from Cookie-cutter Sharks which seem to delight in taking small bites out of the flanks of these whales (look closely at the photographs on this page and you can see a few of these scars). The dorsal fin of a Sei Whale is proportionally larger and more erect than that of most Finback whales. I like to describe Sei Whales as looking like an over-turned surf board. Whalers used to identify this species by watching the way in which they swam. Sei Whales change direction very erratically when feeding, surfacing only once before changing direction again. What they are actually doing is cutting back-and-forth through swarms of copepods or krill. Fin and Minke Whales don’t feed in this manner and usually take a series of breaths (3-5 on average) while swimming in a fairly straight line. Obviously swimming style alone is not enough to identify a Sei Whale, but it’s something that you no doubt notice if you are lucky enough to encounter this rare species. The name “Sei” is an adaptation of the Norwegian word for Pollack (“Seje”) and these whales were called “Seje” or “Pollock Whales” because large numbers of Seje/Sei Whales showed up along the Norwegian coast at the same time schools of Pollack arrived. It was assumed that they followed the pollack in towards shore because that was their food source, although this turns out not to have been the case. Most likely the whales and pollack were both following swarms of krill or copepods. Sei Whales are a widely distributed species (they are found in all major oceans) but little is known of their biology or habits.